Parrot of Blue Part Deux. You may recall him as the handsome guy who posed for me at the National Aviary on our recent visit this past weekend. He was just too irresistible for me not to have some fun with. And I happened to finally hit it right and remember this month that it is our “official unofficial” Draw a Bird Day – which a group of bloggers celebrates every month on the 8th. Seems it is a bit of a bird week for me this week at thecreativelifeinbetween. This cutie is going with us to the Lake Latonka Fall Festival tomorrow, where he’ll be for sale as an original, prints or cards, along with loads of others you’ve seen here and that are in our McKinneyX2Designs ETSY Shop, as well as a wide variety of fall, holiday, kitchen, and farmhouse-design signs created by my daughter-in-law Colleen from reclaimed pallet wood. My son, Jake, even got in on the action with some amazing artwork too that will knock your socks off! He also built us a landing page website (mx2d.com), where you can access our ETSY shop, Facebook page, and Instagram. If you are anywhere near Mercer, PA tomorrow, come find us at the McKinneyX2Designs booth outside the red barn. We are having a drawing for a gift card to our ETSY shop and are doing some “show specials!” We’ll be there from 9am – 4pm. Hoping for good weather and fun times! 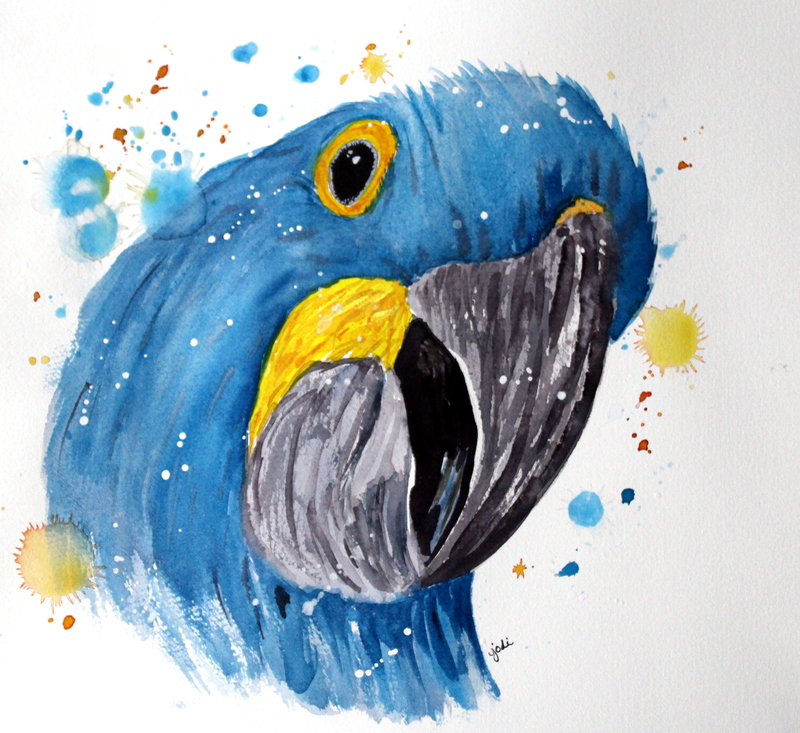 PS This Parrot of Blue Part Deux Watercolor was done with Daniel Smith Cerulean and Prussian Blues, Cadmium Yellow and Orange, and M. Graham’s Neutral Tint, as well as a bit of Dr. ph Martin’s Bleedproof White. Oh Jodi I love him!! Wonderful job! I bet you and your DIL.will do great tomorrow! This guy has plenty of personality. It was a fun surprise to find it hiding in a pile of papers! Beautiful parrot Jodi! Wonderful job! You will have a fun day today selling your paintings and Colleen’s crafts! Have fun and good luck! I’ve visited your Etsy store and it’s delightful. If I did not already have lots of artists in my immediate family I would probably be a good customer. I love the bird. It’s a beautiful blue. Benjamin is in love with your parrot, of course he wants to know “where is the story?” I told him, maybe later and he is mollified for now. “Blue” is a beautiful bird, that is what Benjamin decided to call him. This Fall Festival sounds fantastic, quite a long list of vendors too. Hope the weather is perfect, the customers have big wallets and you have a fantabulous day! Here was the story that I tried on Benjamin: There was a parrot named Blue, A friend to all he knew. His home was in a big zoo, until…The door opened and away he flew! His response: “Gem, I don’t love it.” He’s a harsh critic. Thus ends my short lived career as a storyteller! Thank-you Jodi! I was impressed with myself, Benjamin not so much. P.S. I missed a word in the second line (A great friend to all he knew). Oh well, I was so close to fame and fortune. lol! Looking forward to having fun! Bit of a long haul for tomorrow but I am certainly planning to come and see your work in situ (and take you up on a visit to the live bird) when I’m back whenever it may be. I’d recognise that beautiful boy anywhere! lol! sounds like a deal! I would love to see!! Aww, he is gorgeous Jodi. Such a beautiful shade of blue ! He is fabulous Jodi! Good luck with your sale!